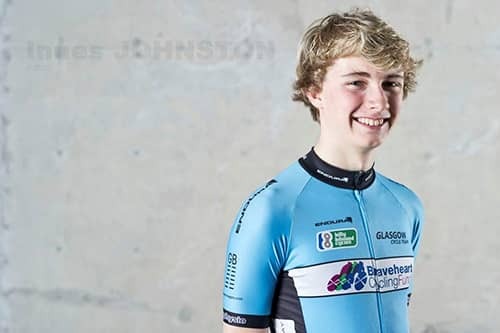 Danny, Calum, Euan and I have been selected to be part of the on-going Scottish Cycling iDevelop programme. Lest week we did our first five day training camp. The first three days were in Glasgow with last two based in Stirling. 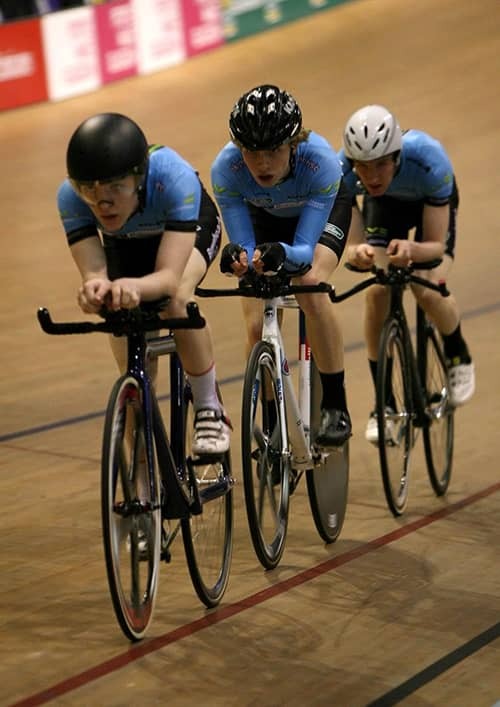 The camp started with the Easter Pursuits Track League at the velodrome in Glasgow where we completed two, 2km team pursuits. Our quickest time was 2m 18.80 which got us second place despite only having 3 riders (Euan couldn’t make it on the night). The next day we had a Strength and Conditioning workshop in the morning which showed us plenty of exercises which we should do to improve balance, coordination and power output on the bike. After this we got changed and headed out for a training ride. This included a mock race where each rider was given a role to perform and an 8 mile TTT. After the road ride we had a track session that included a 3km Individual Pursuit and Rolling 2km and Flying 1km Team Pursuits. The day ended with a nutrition workshop and meal planning for the two nights away in Stirling on Friday and Saturday. On Friday we had a track session in the morning focusing on starts using a 98” gear. This is a bigger gear than the Youth A and even the Junior gearing I was used to and my legs were feeling pretty fatigued by this stage in the camp. After lunch we set off on a ride out to Stirling Youth Hostel. It started off dry but as we descended the Crow Road and headed up Carron Valley the rain came on. In the end it was bucketing down. To top it off our route to the hostel included several fords that were gushing with water which got our feet even colder and wetter. We finally got to the hostel and made pasta for dinner followed by an evening workshop looking at our starts from earlier on in the day. Saturday was the longest day on the bike, in total 172km, Eighty kilometers of this was racing in the Glasgow Nightingale Lake APR (Australian Pursuit Race) where we averaged 41kmh. 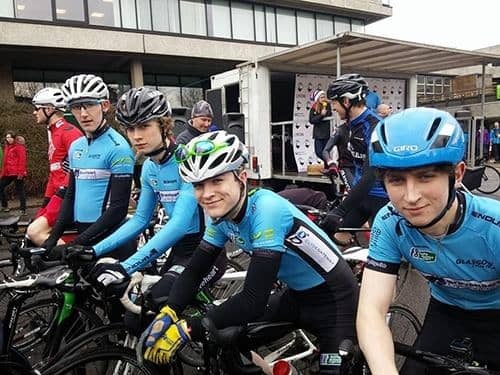 It was a tough race and I finished 37th, four minutes down on the winner Thomas Gelati (YthanCC) but second placed Junior behind Joe Reilly (Spokes Racing Team) who finished 9 seconds ahead in 31st place. After the race we had then rode to Dukes Pass for a Time Trial effort. This took even more out of my legs but thankfully we had an easy ride back to the Youth Hostel after it. Sunday morning we were all feeling pretty tired. Despite that we had a road ride in the morning with Team Time Trial training and then a mock 3 mile race before we rode back to the Hostel to get changed and eat our lunch. It was then off to Striling Univesity to race at Crit on The Campus (CoTC) . All four of us were riding the E/1/2/3 race with the senior riders and some of Scotland’s professional riders like Evan Oliphant and David Lines. The race was 50 minutes and 5 laps long. In the end it was British Cycling Junior Academy rider Joe Nally that won with our U23 team-mate Angus Claxton finishing fourth. After all the training and the racing the day before my legs were tired at the start of the CotC race and I could hardly turn the pedals in the race. I kept going as best I could but got lapped 3 times. Over all the camp was really hard but really useful as it wasn't just hard training but learning lots of skills off the bike since we had to cook our own meals and organise ourselves for each day's training. My next race is this weekend at the Fawkirk 10mile Time Trial. Hopefully I will see the benefit of the training and weeks rest to post a good time.